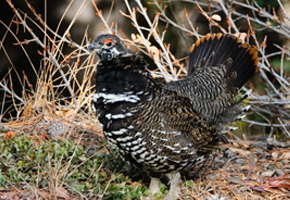 The following lists most North American upland game birds excluding wild turkey. The most common species of quail, the bobwhite is often referred to as the number one game bird of the eastern and southern United States. It ranges from Canada to Mexico and is found east of the Rocky Mountains. 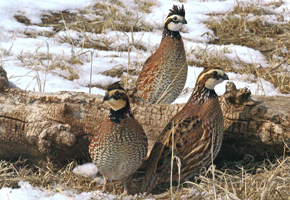 A combination of fields, brush, weed patches and wood lots are ideal places for bobwhite habitat. 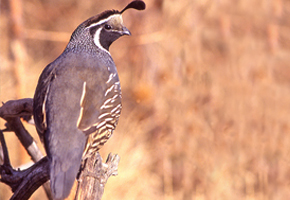 California quail are the most popular of the five species of western quail. They range in the north and southwestern part of the United States and have been successfully introduced into western Canada. 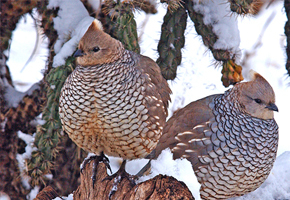 California quail tend to roost in trees and can form large coveys with hundreds of birds. Foothills, valleys with grassland, moist chaparral and scattered trees are their preferred habitat. The Chukar (Alectoris chukar) is a gallinaceous gamebird, related to pheasants, grouse, and quail. 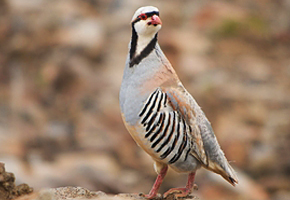 A medium sized ground dwelling bird, the Chukar weighs in at about 20 ounces and is generally 14-15 inches in length. They are not sexually dimorphic, but that males tend to be larger and more intensely colored, and many have a small “spur” on each leg. 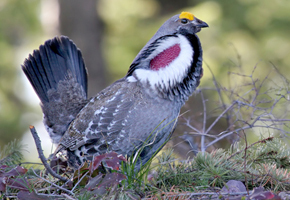 The Dusky Grouse (also known as Blue Grouse) is the largest species of mountain grouse. Both sexes have long , square tails which are unbarred. Males have slate-colored upper parts, white-based neck feathers around the air sacs, and yellow-orange eye combs. Females tend to be browner than males and have barring on the head, neck and back. Also known as desert quail, the Gambel's quail is located in dry regions of the southwestern United States. 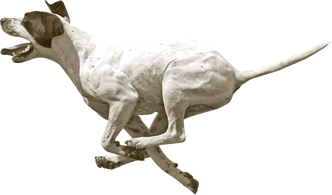 It thrives in the dry-arid regions that consist of desert shrubs. 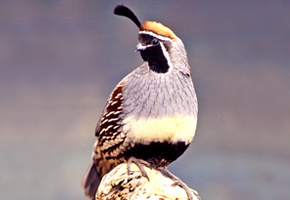 Gambel's quail, along with the California quail, are the only two species to have successfully interbred in the wild. North American distribution of Pinnated Grouse (Greater and Lesser Prairie-Chickens) once ranged from the Gulf Coast to Southern Canada, and from the Atlantic Seaboard to the Rocky Mountains, but this range has been steadily decreasing over the centuries. 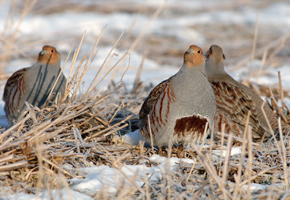 Hungarian Partridge sexes are similar in color. The adults have cinnamon-colored heads, gray sides with vertical chestnut bars, and grayish to brownish backs. Gray Partridge usually flush in coveys of 10 to 15 birds, and the rufous tail feathers are conspicuous on birds in flight. Medium-sized grouse weighing 700-800 g. Total length 38-41 cm. Sexes and plumages similar throughout year. 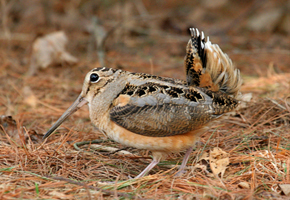 In adults, plumage is uniformly barred with alternating brown and buffy white bands. Upper parts are darker and more richly colored than underparts. 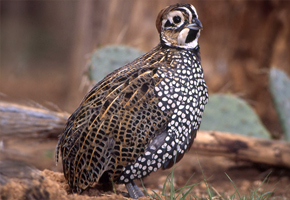 With the smallest range in the United States, the Montezuma Quail is found in southern Texas, New Mexico, Arizona and Mexico. They live in mountain areas populated with oak and juniper trees as well as grasslands. Often referred to as Messena, Montezuma or Harlequin quail, they have a unique coloration of feathers which aids in their means of camouflage. The largest quail species found in the United States, mountain quail possess a unique characteristic of two straight feathers that arch over the back. 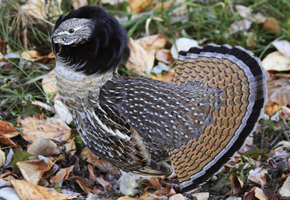 Their fall range is consistent with that of the California quail. They will also migrate into the mountains in the spring to nest and return to lower levels in the fall. 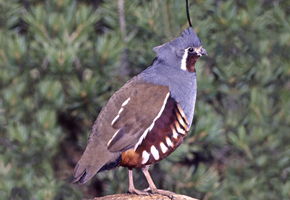 Mountain quail prefer habitat in brushy clearings or forested areas. 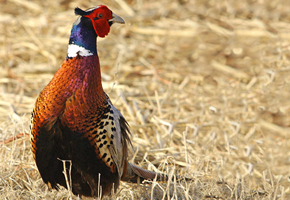 The first successful introduction of pheasants to this country occurred in 1881 when Judge Owen Nickerson Denny (US consul to China) shipped 30 Chinese ringnecks (26 survived the journey) to his home in the Willamette Valley of Oregon. 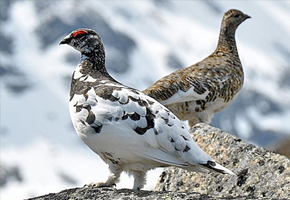 A true bird of the tundra, the Rock Ptarmigan changes its coloring between seasons to blend in with its surroundings. It is pure white in the snow-covered winter, but mottled dark and white when the snows melt. Ruffed Grouse (Bonasa umbellus) are the most widely distributed resident game bird in North America, living now or recently in all of the Canadian Provinces and in 38 of the 49 states on the continent. The Greater Sage-Grouse (Centrocercus urophasianus) is the largest grouse in North America. 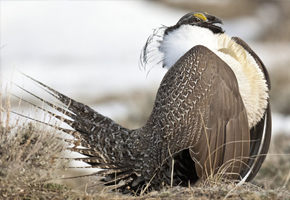 Its very large size, long pointed tail, and distinctive drab gray and white plumage distinguish the Greater sage-grouse from all other North American grouse. 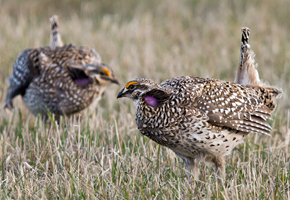 Sharp-tailed Grouse have a mottled, light brown appearance. Distinguishing features include a short, pointed tail, white spots on the wings, and dark V-shaped markings on the breast feathers. 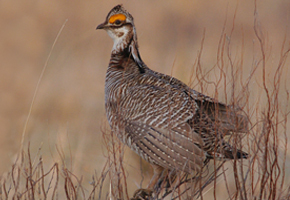 There are 6 subspecies of sharp-tailed grouse in North America ranging from the Great Lakes. 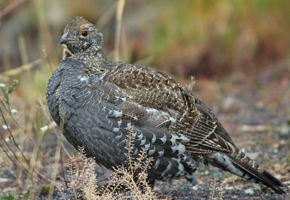 One of North America’s largest grouse, the Sooty Grouse used to be considered the darker, coastal subspecies of the Blue Grouse. Recent DNA evidence supports the spilt of the Blue Grouse into two separate species, the Dusky Grouse and the Sooty Grouse. The male’s deep booming call is hard to locate. Both sexes have tail feathers that are unbarred and narrowly tipped with white, and feathered legs. Males are gray and black above, with a black throat and a well-defined black breast patch bordered with white-tipped feathers; they have scarlet eye combs. Females are mostly white beneath but barred with black, gray, and buff. 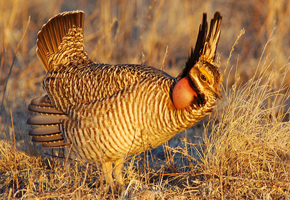 Females are also extensively barred on the head. 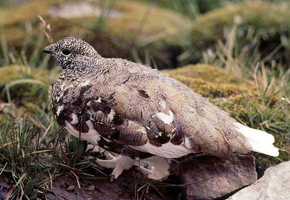 The White-tailed Ptarmigan is a grouse of alpine (above treeline) habitats. 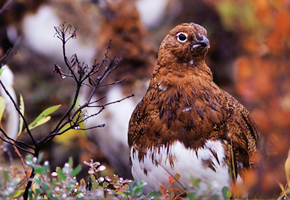 It is the smallest grouse in North America (total length 30 to 31 cm, weight 295 to 440 grams), and the only species of grouse with white tail feathers. It possesses cryptic plumage that changes annually from white in winter to grayish-brown in summer. A typical bird of the arctic tundra, the Willow Ptarmigan is the largest and most numerous of the three ptarmigan species. Medium to large chicken-like bird. Thick bodied. Tail moderately short, rounded, and black. Completely white in winter. Barred rusty brown in summer. Wings, white. 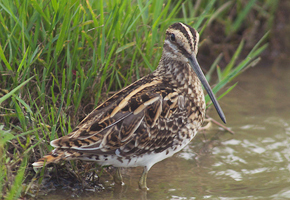 A common shorebird of wet, grassy spots, the Wilson's Snipe has an extremely long bill that it uses to probe in the mud for small invertebrates. Its camouflage is so good that it often is not seen before it flushes from the grass.